The death of Dr Bohuslava Bradbrook on February 21, 2019 is a sad loss for everybody who had the honour of knowing her. Her gentle smile, a deep interest in English as well as Czech literature, and a friendly attitude to her students and friends were Bohunka’s hallmarks. She was first of all an excellent teacher and in the academic world a generally recognized authority on the Czech literary giant Karel Čapek (1890-1938). Her book Karel Čapek, In Pursuit of Truth, Tolerance and Trust (Sussex, 1998), translated by herself into Czech and published as Karel Čapek, Hledání pravdy, poctivosti a pokory (Academia, 2006), is an indispensable text for anyone seriously interested in the works of Karel Čapek. Bohunka´s friends and relatives organized a commemorative funeral service at the Evangelical Church of Czech Brethren in the Jarov quarter of Prague on March 16. Bohuslava Růžena Nečasová was born as a second child to a grammar school teacher parents in the Moravian town of Valašské Meziříčí. Her brother Jaroslav Nečas (1913-1988) also became a teacher and published poems and books for children, e.g. Valašské pohádky – Valachian Fairy Tales, 1943, 1946, 1948, Pohádky z Podbeskyd – Fairy Tales from Lower Beskydy, 1943. Bohuslava known to her friends by the diminutive of Bohunka studied at a teachers college, during the war started her career as a teacher and after the war was admitted to the Faculty of Philosophy, Charles University in Prague, that had been closed during the German occupation together with other higher education establishments. She studied Czech and English there, wrote a doctoral thesis on the English author George Elliot (1819-1880), and following her PhD graduation in 1952 she decided to flee the Communist Czechoslovakia together with a friend Tomáš Hlubík. His son Jonathan was among those present at the Jarov service. The decision to become a political refugee was an exceptionally hard one because Bohunka was very close to her mother whom she could not even inform of her plans as she explains in her excellent autobiography Osvobozující láska malých věcí, The Liberating Beauty of Little Things, subtitled Uprchlická odysea z Prahy do Cambridge. Her generation of refugees were not welcome with open arms in the United Kingdom, but after a tough life in Austrian refugee camps (where “six out of ten women were prostitutes”, Bohunka said in an interview), she managed to get a British visa with the help of Muriel Bradbrook, a prominent Shakespearean scholar. Muriel´s youngest brother, Frank, taught at the university at Bangor, Wales, where Bohunka eventually also got a job. Frank fell in love with her, the feeling was mutual and they became husband and wife in 1956. Frank, a literary historian, was often travelling to Cambridge University libraries. Bohunka won a grant to study Czech and Polish at St Hugh’s College, Oxford, wrote a dissertation on Karel Čapek and the western world and obtained her second doctorate of philosophy. Inspired by visits to the USA with Frank, in 1966 Bohunka together with a few academic friends, most of them Czechs, founded the British branch of the Czechoslovak Society of Arts and Sciences (SVU) in London. It was no easy life to travel between Bangor and London (each train journey taking four hours in those days), organizing lectures, frequently lecturing, too, usually on Saturdays. But Bohunka was still young, full of élan, and her Frank was always there to rely on. Frank was a great help with financial as well as moral support, she told me. Yet, Frank was not a great Czech expert and instead of BOHUNKA, he called her BOUHANKA. Theirs was a great love, but it was not to last. Just before their retirement, which they had planned to spend at Cambridge, Frank died of cancer in May 1983. However, Bohunka did go to Cambridge. She spent 22 years there teaching English literature and works of Czech writers such as Karel Čapek, Milan Kundera, Bohumil Hrabal and Josef Škvorecký at the university of the third age. When Communism in Czechoslovakia collapsed in 1989, Bohunka offered her services to her homeland and started teaching at several Czech universities. She was not a youngster any more, but her stamina and dedication were remarkable. In 2007, Bohunka decided to move to the Czech Republic, because of her deteriorating health and because she could rely on the support of her nephew Dr Jiří Nečas and his family. She had a flat in Strašnice and carried on, business as usual. By then, of course, she had to take things much more slowly. Yet, every Sunday she went to the Evangelical church service and was usually invited for lunch by her family. In 2013 the Czech Foreign Secretary Karel Schwarzenberg bestowed on Dr Bohuslava Bradbook the Gratias Agit prize for the promotion of the Czech Republic abroad. I became one of Bohunka’s successors as SVU British chapter chairman and it gives me a great pleasure to say with some pride that we nominated Bohunka for this accolade. Bohunka also published A Handbook of Czech Prose Writing, 1940-2005, where she introduced 35 Czech prose writers to the English speaking world. 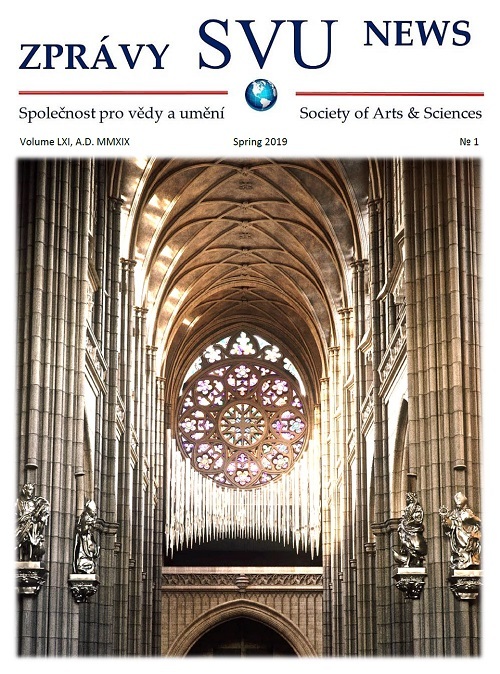 It came out in Czech as Příruční slovník českých prozaiků. At the time of writing, Bohunka’s ashes were going to be dispersed at the garden of remembrance, Vokovice cemetery, western Prague. Bohunka’s was a great, fruitful life. We shall miss her.